Here at Pearson we felt it was time to shake things up in our Neo community. And the shake up came in the shape of this beautiful tile from the team at Social Edge Consulting. We're talking about the The Blog Tile and we implemented it into Neo just last week. It is fair to say I'm in LOVE. I'm also a little embarrassed to say that I spent my Friday night putting it into as many places on Neo as I was allowed (surprisingly few as I don't community manager as many places as I used to) but enough to show you some wonderful examples of it in action. Firstly we've added it to our homepage. 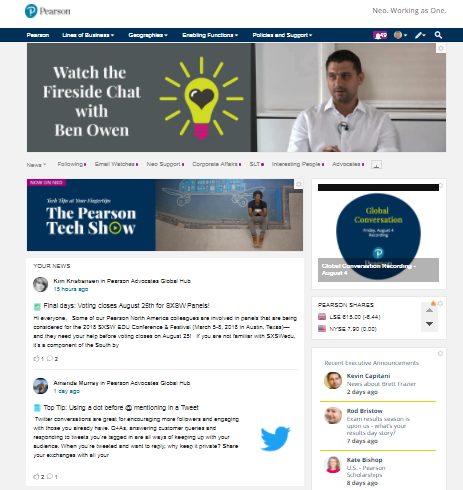 Pearson has a massive blog culture, all our Execs, SVPs and VP's blog as part of their communication and engagement strategy. But displaying our senior teams content was only possible using the superlist tile and even then it only showed the title of the blog. We now have all of our execs listed in the blog tile and we can choose to display the image from the blog or their profile photo. If you have questions about the Blog Tile or would like to schedule a demo of the configuration panel, please email us at contact@socialedgeconsulting.com.